Update, 20 May 2016: Following very keen interest, the Eighteen Nineties Notebook is now out of print and is no longer available to new members of The Friends of Arthur Machen. Copies will be sent to all existing members, including new members who joined before this date. In the Eighteen Nineties, when he was writing his literary masterpieces, Arthur Machen kept a notebook of his ideas, plots, alternative endings and draft writings. Running to over 300 pages, it is a unique record of a visionary writer at work, compiled when Machen’s writing was at its peak. It includes many new insights into The Hill of Dreams, Ornaments in Jade, Hieroglyphics and other titles of the time. 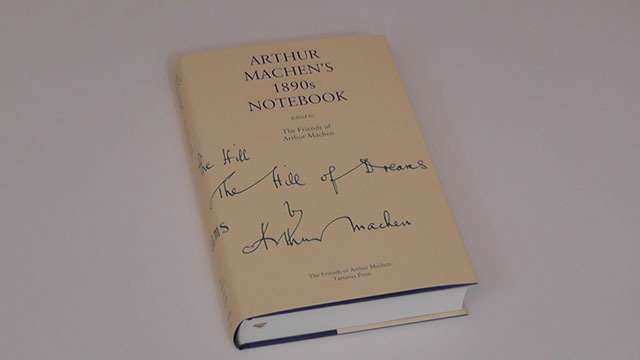 The Friends of Arthur Machen, in association with Tartarus Press, has just announced an annotated facsimile edition of the Notebook, a landmark in Machen studies. It is sure to become a collector’s item as well as a fascinating resource for Machen readers and scholars. It will only be available to members. A copy of the Notebook was kindly obtained for the Friends by eminent Shiel scholar Harold Billings, from the Harry Ransom Centre at the University of Texas, and was initially studied by the late Roger Dobson. In the past year, a group of Machen researchers from the Friends, led by Ray Russell and Rosalie Parker, have been transcribing and annotating the manuscript. Arthur Machen's Eighteen Nineties Notebook is a sewn hardback of 347+viii pages, printed lithographically, with silk ribbon marker, head and tailbands, and d/w and decorated boards, and is limited to 300 copies. Members of the Friends also receive two annual mailings of the hardback journal Faunus, full of Machen rarities and new scholarship, and the newsletter Machenalia. To join the Friends and receive both these and the Notebook, please subscribe here. Thanks to all involved with this amazing project! When I re-joined FOAM I had no idea this book was being produced, I have just been to my first FOAM AGM, and certainly recommend the Society to anyone who frequents this website. The book is a fabulous bonus, the people you will meet are the real reason you should join this society. Thanks to all involved for this delightful surprise, which arrived the other day.